Lyle: This is a 5 string chord, don't play the 6th string. Make sure all the notes ring clearly. 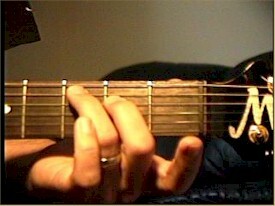 Lyle: This technique of pushing down on two or more strings with one finger is called "barring". 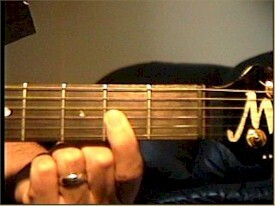 Lyle: The open DM7 chord is just a 4 string chord, but it's ok if you hit the 5th string with it. Lyle: Notice you skip the 5th string. 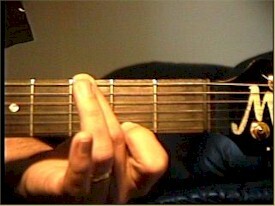 Your middle/2nd finger gently mutes the 5th string. Lyle: Now that you have been introduced to these fine chords, it's time to try playing them in a progression! Lyle: It's a little fast but you can do it! For the average beginner, this exercise can be tough because you're playing 5 new chords and switching every 4 beats. It can be a lot to memorize, but it's a good challenge! Lyle: Notice how the combination of different chords create a rich harmonic and melodic sound in progression 2? Lyle: Exactly! It's from a Riff Interactive CD-ROM I made called Rock Legends I - George Harrison Style. Yes, they were all about harmony and melody, so they used these colorful chords. Lyle: Well that's about it for this lesson. 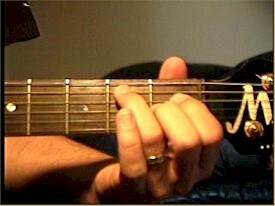 You have new chords to memorize now and two progressions to master. 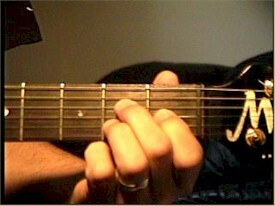 Make these chords sound good, then take a break before going on to the next lesson. If you have questions about this lesson, email me at Lyle@theguitar.net. Thanks.